Located in the northwest of the Rhodope Mountains, Velingrad has become somewhat of a byword for spa in Bulgaria, for its charm lies not only in the beautiful scenery, but also in the healing qualities of the local mineral water. With its abundance of hotels and pubs Velingrad is a preferred tourist spot, and the fact that most hotels, even the small ones, have their own mineral pools, doesn't hurt its reputation of a nice place to relax. Spa treatment is also on the rise there with various types of massages and aromatherapy baths. Jacuzzis are a common sight in most hotels and local therapeutists are trained to handle various disturbances of the locomotory system as well as neurological disorders and respiratory complaints. As for Velingrad itself, the city was once three villages that were united in 1948. 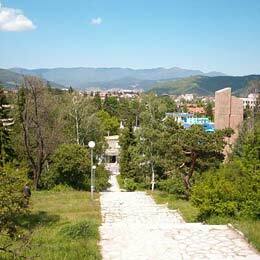 Lajene, Chepino and Kamenitsa became the three districts of Velingrad, each with its own downtown area, parks and alleys. After the unification the city became a leading cultural, economic and administrative center in the region. Velingrad - blessed and eternal, the city's motto states and locals are right to believe so, for apart from their tourist magnet of mineral springs, the area also hides traces of ancient Thrace tribes. Dated as far back as the VI-V century B.C. ruins, necropolises and remains of fortresses still attract many history lovers. If you are not quite fond of pool-and-massage relaxation you would certainly not stand the temptation of forest hiking just around the end-town streets. And if quiet meditation is your beer, than grab a fishing rod and head for one of the lakes surrounding the city. For ski beginners nearby Jundola site offers excellent tracks and amazing scenery over the valley.